On the evening of Wednesday June 11, I will be taking part in the Clock Tower Desert Island Book Choice – part of the Crouch End Festival 2014. As a former Crouch End gal, this gorgeous part of north London is still so close to my heart. I used to spend lots of time writing in The Haberdashery, where I was lucky enough to be able to hold my second book launch, and also, of course, Crouch End Library. I’m delighted to be returning to the library for this special event. I am honoured to be joining authors Tom Campbell, Louise Millar, Matthew Baylis, and Callum Jacobs as we will discuss why we heart CE, what we’d pick as our desert island novel choices, and read extracts from our books! I hope you can come along, it would be lovely to meet you. We will be signing copies of our books too! In my three years of living in this gorgeous city I’m glad to say I’ve discovered some inspiring places to write books*. Not only that, but some parts of the city have ended up in my books, either directly, or as the inspiration behind some fictional places. While I’m usually holed up inside, squinting at my laptop, it’s nice to get out sometimes for a change of scenery. It’s even better when one of those wanders forms the basis of a scene. Here are some of my favourite spots to write when I do tear myself away from the house, and some of the places that inspired chapters in This is a Love Story and Three Little Words. I’d love to know yours too, so do please get in touch and let me know. I must admit I’m a little bit in love with this cafe. I discovered it when I lived in Crouch End and I kind of knew I would adore it before I even went in. I don’t know if it was the fairy lights (all year round), the pretty bunting that hung outside, or the chalked sign by the door that said ‘Unattended children will be given espresso and a free kitten’ (I know, I don’t get it either). It just kind of seeps shabby chic from several metres away and you can usually hear laughter and the chinking of crockery whenever you walk past it because it’s really popular. When you step inside it only gets more sweet. There are homemade goodies on sale ranging from distressed teddies to quirky paintings, your drinks arrive in mismatching tea sets that look adorable and there’s a real local feel to it. I spent a lot of time in there with my laptop and a latte, working away on Three Little Words. It really was a very happy time for me. I loved The Haberdashery so much that I held the launch of Three Little Words there and it was a fabulous venue that I would highly recommend. It was great to celebrate the book in the exact spot where some of it was written. While I’ve never walked into this shop, fired up my laptop and started writing (which would be weird), it’s a wonderful hangout if you’re looking to ‘get to know’ your characters. It’s great to see some wild and wacky clothes, imagine them on your heroes and heroines, and think about how they look and dress. Whilst your character’s imaginary wardrobe is certainly not the basis for a well rounded pretend person, I find it really helps to picture them clearly in my mind. One of the first bits of golden advice from my agent was to walk around shops and just look at things, feel fabrics and textures, and imagine exactly what your character would wear. In addition to being a great excuse to hit the high street, it’s also genuinely a brilliant way to decide whether you want your lead gal wearing leopard print platform brogues and a tracksuit or whether she’s a smart shirt and jeans kind of lady. This is a thinking space for me, a great way to escape and consider plots and characters (also lovely for running, if you’re into that). If you’ve never been here I would suggest starting at the bottom. Jump on a bus from Finsbury Park and get close as you can to the bottom of the park and then walk all the way up to the top. Don’t peep, however tempting it is, until you are right in front of the palace itself. And then turn around. The view is stunning. You can pretty much see the whole of London spread out before you and it’s a nice to sit there and think about deep and meaningful stuff. I was so touched by Alexandra Palace that it inspired a scene in This is a Love Story, where Nick and Sienna go to the park. I always remember that when I return and that’s why for me, it’s one of my favourite parks in London. Balham was a big part of This is a Love Story, although the venues/office I wrote about were made up. It’s the general feel of Balham that I love, even the train station is quaint and somehow rather pretty. One of my favourite real-life venues in the area is The Balham Bowls Club. It’s got a really old fashioned feel to it and so much personality. I also sang at The Bedford in Balham when I was in a band last year and it was a fantastic music venue. Hornsey Library is modest and tucked away from the High Street. I spent many hours writing Three Little Words there. I don’t know what it was about this library, but I found it a great place to really be able to concentrate. One of the loveliest things about this library is the gallery space upstairs. They always choose really cool exhibitions to show. Next to the gallery is a lovely little cafe that was (and I hope still is) run by a wonderful guy who wears pirate inspired attire. It’s always interesting to see a story you already love presented in a different way. 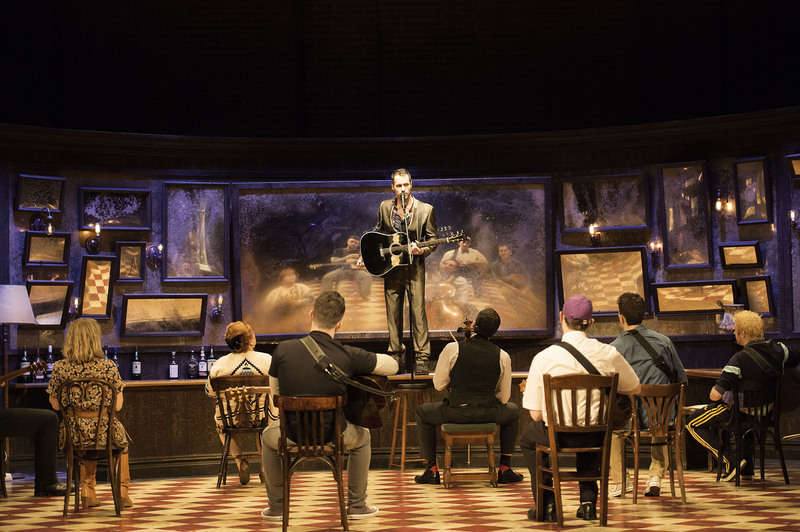 I was thrilled when I was given tickets to see Once at The Phoenix Theatre in London’s West End for my birthday because I was already a huge fan of the film. Well… I’m glad to say… it was wonderful. Within about 15-minutes I was in tears, which has to be a record, even for me (I mean seriously, fifteen bloody minutes?!!). ***PACK TISSUES GUYS***. To hear Falling Slowly live was something else. The singing and musicianship was in my opinion as stunning as it is in the movie itself. The set was simple but hugely effective, in fact one of the most unusual things about this show was that we walked in to find the cast casually playing music on stage and ‘hanging out’ before that seamlessly turned into the start of the show itself. It made a nice change to eating all the Maltesers too early out of boredom. The plot had been given just the right amount of that West End treatment without in any way harming the gentle nature of this delicate love story between Guy and Girl in Dublin. Declan Bennett’s voice was perfect. Phoebe Fildes’ vocals were gorgeous. The chemistry between them was a joy to watch, just as it was with Glen and Marketa. The smaller characters too shone brightly, and were all memorable and entertaining. It’s a very good sign when a couple of weeks after seeing a show you can still picture all the characters and remember their voices. Once the musical was everything I hoped it would be and more. For those who love the film’s music, just being there and hearing those precious songs come to life with guitars, violins, cellos, drums, a piano and goodness knows how many other instruments really is worth it, and that’s before you even get to the great performance of this stunning love story. Go and see it, you won’t regret it (but watch the film too if you haven’t already)! Today my boyfriend and I decided to head to Brick Lane for an afternoon of general wandering. I wasn’t really in the ‘shopping mood’. I was happy just pootling around, taking in the sights and smells, and wondering how everyone was managing to be so effortlessly cool. Then Andy and I decided to pop into a place called ‘This Shop Rocks’ on Brick Lane. It sells all sorts of vintage things from plates to hats and candlestick holders. As soon as we walked in I was instantly amazed at all the stuff inside, it was like a treasure trove and certainly lived up to its name. As I walked round the shop, I pictured serving friends cocktails in vintage milk bottles with weird straws and cooking delicious foodstuffs with some seriously funky pans. You probably know the scenario all too well yourself. You instantly start imagining the things in your home/in your hair/over your shoulders and how bloody amazing they would be. Anyway, I’d just about managed to control myself (reluctantly slinking away from the milk bottles), until we walked round and saw something A*M*A*Z*I*N*G. And that was it. I FELL IN LOVE. I fell head-over-heels in love in the way that so many people do with inanimate objects on aimless Sunday afternoons. It’s unexpected. It’s magical. Your bank account does not like it but who cares BECAUSE IT’S LOVE. Not got it yet? 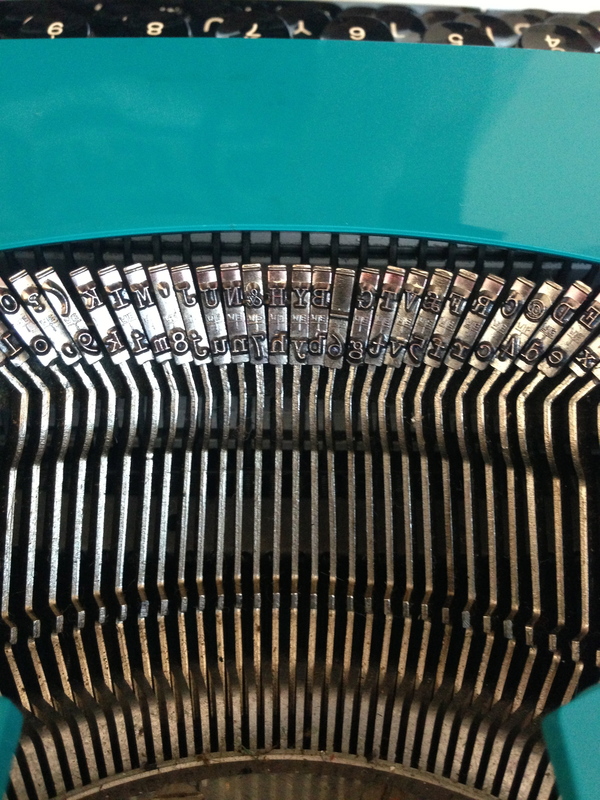 It’s a vintage typewriter. 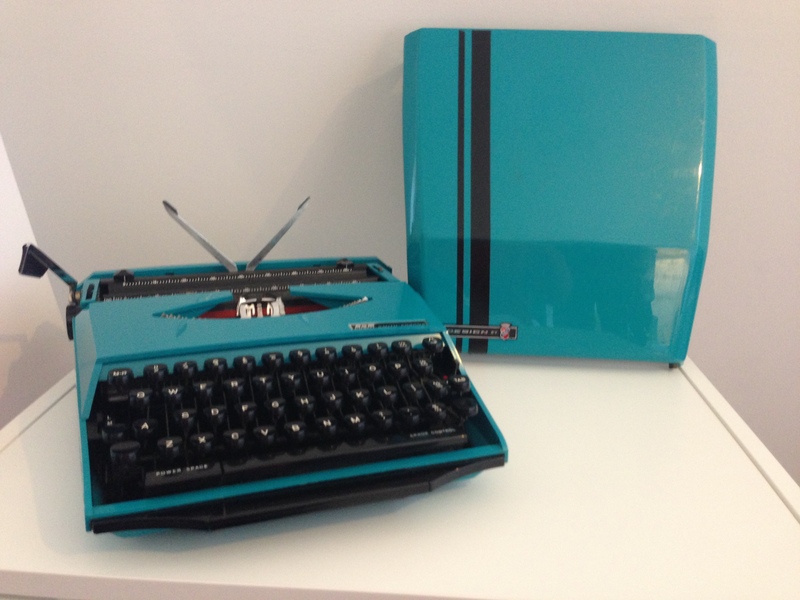 It’s called a ‘Super G’ and it’s made by Smith Corona in collaboration with Ghia, and I believe it’s modelled on a racing car (complete with racing stripes). It was made in the 1970’s. This means the typewriter is older than me, which I think is really cool. Like the geeky things we are, Andy and I rushed home to clean it, polish it and generally tinker with it until it shone like the sun. I did some research and it was also manufactured back in the seventies in orange and brown. It’s beautiful. One of the loveliest things about this unexpected purchase is wondering what has been written by its previous owner/s… How many letters, words, sentences (or even whole stories) it has aided and how magical that all is. It looks like it has been well loved and well used, and it has known language before I was even born. Now, I love my laptop and wouldn’t be thrilled with the idea of producing a whole manuscript on a typewriter nowadays, but there’s something so cool about the clunky feel to its keys, the clever but so simple mechanical functions it has, the sound of the paper being rolled into place and the TING when you get the end of the page. It’s like being a kid again. Anyway, just thought I would share this with some fellow book lovers, avid readers and writers who might just find it as fascinating as I do.